Aboveground pools are a cheaper option than inground pools, and they generally take up less space and can be taken down after each season if you prefer. However, a downside to having an aboveground swimming pool is that the air is cooling the water from the top and sides of the pool. This can make the water a little too chilly for comfort. 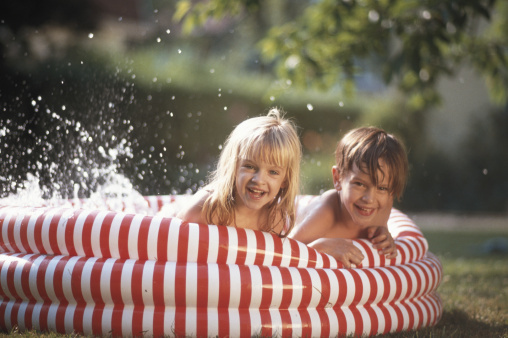 Luckily, there are things you can do to help keep the water in your aboveground pool warmer. Aboveground pools can be hard to keep warm. Install a pool heater to your aboveground pool. Energy-efficient options are available to help you save money, but this is by far the most expensive option for keeping the pool warmer. Use opaque pool covers on your aboveground pool. Opaque covers do a better job of keeping the water warm than translucent or clear covers, according to the U.S. Department of Energy. Cover your aboveground swimming pool at night either with a solar cover or a standard pool cover. This will keep the warm temperature that was achieved during the day throughout the night. It also helps to keep out cold air, which otherwise will lower the temperature of your pool.